Veronica Roth’s captivating third installment to the Divergent series, Allegiant, continues to prove itself as intriguing as the previous two books in the series. 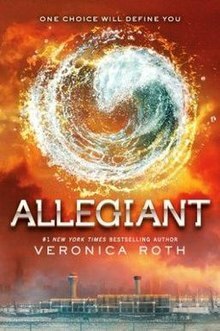 Roth builds a familiar landscape of the broken world that Tris Prior lives in; Allegiant continues in a future dystopia where the “world” that Tris lives in is divided into five factions-or ways of life. At sixteen, each individual takes a test–comprised of taking a serum that forces the undergoer to face mental scenarios where each choice matters–to see which faction will be their new identity. The five factions all follow their own virtues–bravery, intelligence, selflessness, peace, and honesty–and Roth brilliantly contrasts the readers with Tris’s life. Unlike the world we enjoy today, where a person may have many virtues of being perhaps brave, intelligent, and selfless, among other traits, the faction members only live based on one. However, ties are made between the reader and Tris as her test result comes out “divergent,” shunning her with not one virtue, but with many. In Allegiant, the trilogy continues to test the limits of what Tris will do to save her family, friends, and world. Uncovering the secret that the world continues on outside the fence of her city, Tris and her friends enter the “outside world” where they show allegiance to one another and learn that the faction system–essentially their whole way of existence–is just the government’s way of dealing with the “genetically damaged.” Roth continues writing in Allegiant about relevant matters, such as corrupt governments and war. The faction system was essentially created to make genetically pure individuals, like Tris–in other words, to create divergent people. Dealing with the prospect that the world stretches further than the city she lives in, enclosed by fences, Tris has to face herself with more lies. The faction system was created by the government to cure damaged genes as people who were “damaged” caused outbreaks of war. Roth opens the readers eyes to human nature, however, as Tris learns that wars existed when people were genetically pure too–a direct reference to WWI, WWII, and even the outbreaks of war continuing right now and presumably forever. Although subtle, Roth explains that the government will go to lengths to prevent problems that do not exist instead of focusing on, well, the stuff that matters–a concept we can all agree with looking at our fellow countries. Although heavy with metaphors and references to our own world, the book has themes of friendship, family bonds, and even romance, as the book alternates between points of view of Tris and her boyfriend, Four. Tris is a strong female lead and a true character, dealing with her mistakes and their repercussions, and how it all takes a toll on her bond with Four (I know, funny name) and her friends and family. Perhaps Roth’s greatest ability with Allegiant was that she was able to continue writing true characters who make mistakes, but deal with them, especially amongst war. Allegiant, along with the whole series, effortlessly and dauntlessly battles concepts of sacrifice, honesty, and even depression. The whole series wonderfully captures its readers as it has something for everyone, may it be violence, sci-fi, dystopias, etc. Amongst other series in its Young Adult genre, Divergent stands unique–incomparable to the Hunger Games in many ways except the similar dystopian theme (but just as good!). Most importantly, the book will leave you feeling just as brave and dauntless as Tris, Four, and their friends. A trait that will come in handy when facing final exams.